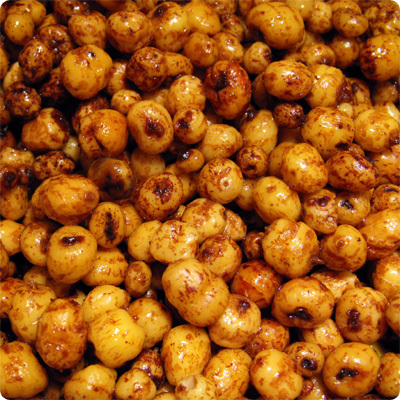 Tiger nuts are not really nuts; they are tubers that grow under the soil’s surface. Also known as yellow nutsedge, tiger nutsedge or earth almond, tiger nuts have been used for many centuries and remain extremely popular all over the western hemisphere. Archaeologists conclude that evidence hints at this food being used in the Paleolithic era. Rich in fiber: Tiger Nuts are packed with high fiber content – around 33 per cent, which is indeed a considerable amount. In a study conducted in 2009 by the University of Miguel Hernandez, Orihuela, Spain, it was found out that 100g tiger nut flour contains around 60g dietary fiber, especially the insoluble dietary fiber, which is much higher than other popular fiber sources such as rice bran, oats, apple, cabbage, carrots, pears. A healthy substitute for lactose intolerance: Milk derived from tiger nut is a healthy option for those who cannot drink cow’s milk due to lactose intolerance. Rich in vitamins E and C: Recent studies suggest that tiger nuts are loaded with vitamins and minerals, especially vitamins C and E and potassium and phosphorus. Yogurt made by mixing cow’s milk with tiger nut milk has been found to be exceptionally high in these vitamins and other nutrients. Protects against cardiovascular disease: The Office of Dietary Supplements of the National Health Institute has stated that vitamin E acts as a catchall reference for different fat-soluble compounds that are rich in antioxidant qualities. Since tiger nuts are rich in vitamin E, all these qualities are present in tiger nut milk and tiger nut flour. Cures erectile dysfunction: Here comes one of the major health benefits of tiger nuts. Tiger nuts are indirectly beneficial in improving the problem of erectile dysfunction (ED). Although there is no medical evidence to support this claim, natives of Ghana have been using this traditional medicine for decades in the form of palliative for treating ED. Good source of magnesium: According to the Office of Dietary Supplements, magnesium is highly vital for the normal functioning of the body, as it is required to carry out more than 300 biochemical reactions in the human body.